86 / 60 Oliver Schöndorfer ! What are variable fonts? 2. Using variable fonts on the web 3. Golden times 4. Hard times How to get started on variable fonts ! glyphe axis-praxis.org 1. Select font or drop font file 2.
glyphe Aa Aa Aa Aa Aa Aa Aa Aa Aa Aa Single font Font family Aa € 30–60 € 300–700 Variable font Aa Roman 110 KB € ? 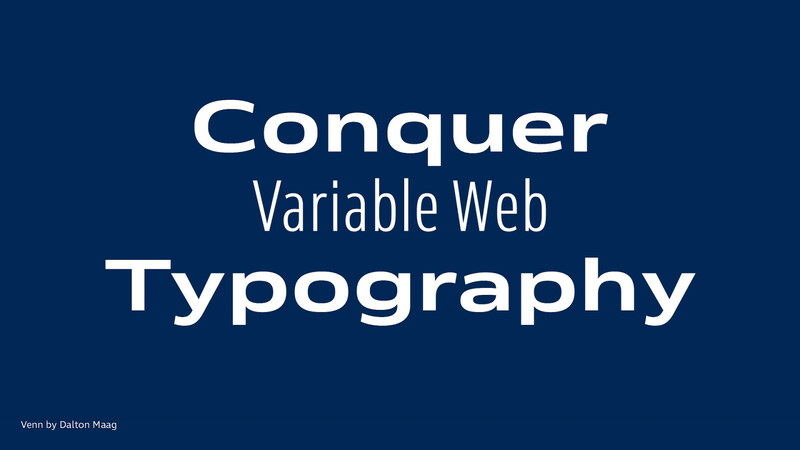 View Conquer Variable Web Typography on Notist. Variable fonts will shape the future of web typography. They can bring great variety and new opportunities at a low file size. But with many possibilities you can also choose wrong. This practical talk guides you through the first steps with variable web typography, accompanied by several use cases and examples. What are variable fonts, what can you do with them, when do they make sense, and what should you be aware of? Be ready for the next technology shift in your browser. Oliver puts presentations on for free. You can too. Hahaha, @glyphe is talking about Typography and it’s hilarious 😂. Also VERY informative.